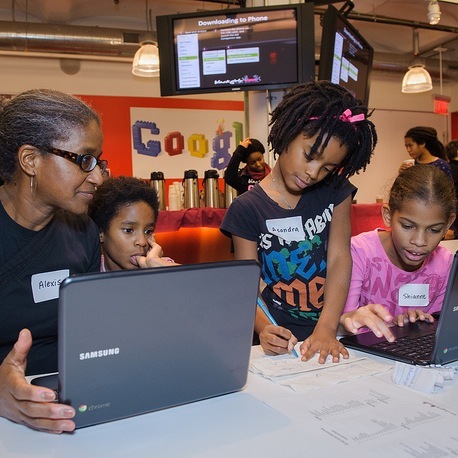 Peta Clarke, a Seidenberg graduate student halfway through her MS in Information Systems, also heavily involved in the program Black Girls CODE (BGC – pictured on the right at Google HQ), is also a Senior I.T. Analyst for the Federal Reserve Bank of New York. In this role, she works as Web Developer, Database Programmer, Software Tester, as well as Business Analyst or Project Manager if need be. Her main responsibility is assuring the quality of Fedwire, the premier electronic payments and securities transfer services that banks, businesses, and government agencies rely on for mission-critical, same-day transactions. Has received requests from more than 80 cities worldwide to bring this innovative program to their communities. 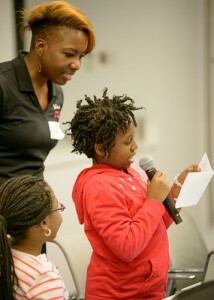 BGC works towards empowering girls of color from ages 7 to 17. The early exposure to S.T.E.M. fields, programming languages, technology mentors, and leadership activities will give the girls tools they need to create their own futures, while providing a network of like-minded peers. Clarke’s work at her bank and her work at BGC have both come together for February, in celebration of Black History Month. The Bank has selected BGC as its service project for February, meaning that 25 students from BGC were invited to the Bank and given an overview of the NY Fed and how the Bank uses technology for daily operation. Bank employees then gave valuable career advice to the students. The event was a success, leaving the students with all kinds of ideas and newfound interests in technological careers of banking. We asked Peta how Pace has helped her in her goals and she brought up Dr. Jonathan Hill’s support. She was working on launching the NY Chapter of BGC, and through Dr. Hill, Pace played host to BGC’s first Game Design workshop this past August. Since then, four other workshops have been held, and more are scheduled to happen. As we segue from Black History Month into Women’s History Month — we felt the need to ask Peta about her thoughts on gender in the technological field. She responded with the idea that “any imbalance places limits on the potential of a community.” She praises the unique perspectives women bring to a group that would be absent among only men. Then, gender aside, Peta states that “we need more people in tech, period!” Computing-related jobs are on a steep incline, and the computing graduates of the U.S. aren’t even filling a third of those jobs.